On Sunday March 17th it was my turn to provide snacks for the church coffee hour. I love to bake and so this isn’t really a chore for me at all. As it was a cold day, I knew that I would serve hot apple cider. As for the baked goodies, I first chose to make gluten-free cheesecake brownies because I know several folks in our congregation who are gluten intolerant. To do this, I merely replaced the all-purpose flour in my brownie recipe with some gluten-free all-purpose flour. Then I mixed 8 oz of cream cheese with 1/4 cup of sugar and one egg until it was smooth and swirled it into the brownie mix in the pan. 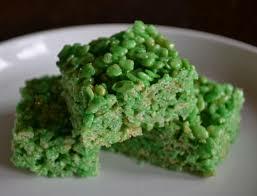 Then, since it was St. Patrick’s Day, I made green Rice Krispie Treats like the ones pictured below because I wanted (felt the need to make) something celebratory. And let’s add a bit of Irish humor here: “Why do you Irish always answer a question with a question?” asked President Franklin D. Roosevelt. “Do we now?” came New York Mayor Al Smith’s reply. 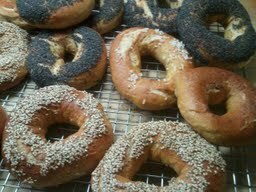 Lastly, I decided to make some home-made bagels for the parishioners who do not (or cannot) eat sweets. Home-made bagels? Yes! About a year or two ago I found a recipe by a man named John D. Lee. For five years, John owned a bagel restaurant and he clearly knows a thing or two about bagels. In this recipe, John demonstrates how to make DELICIOUS bagels in a little over an hour. You have got to try this recipe and let me know how you like it. If you love a good bagel, I think you’ll be amazed that they can be made this simply. Now for the pie of the week. I’d been itching to make a pie and so I scanned our fridge and noticed that there were mushrooms, sun-dried tomatoes, and shredded cheddar – perfect ingredients for a quiche. But who would receive this savory pie? As I rolled out the dough, and sautéed the mushrooms I let my mind wander. The name of the person would come in time. Once assembled, I placed the quiche in the oven to bake. In a short while I thought of neighbors who I knew would appreciate help with a meal. Not because they can’t cook or because they need money, but because their lives are so complicated right now. Here’s hoping my quiche will offer them a momentary respite and give them assurance that they are surrounded by caring friends.